Just like a rugged version of 2014 flagship, Samsung is working on Galaxy S6 Active phone. 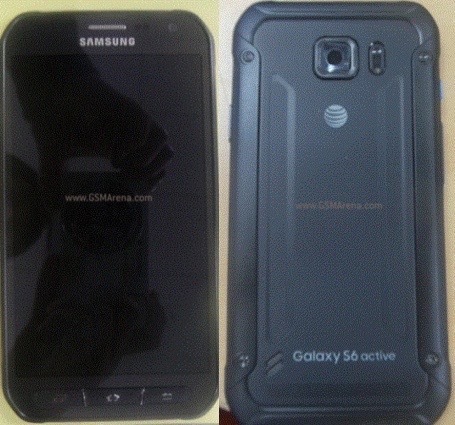 The device pictures were leaked and GSMArena was first to cover it up. These rugged phones are manufactured keeping in mind the users who are always participating in some adventures, where those normal touch screen phones can’t make it. So, a proper protection is provided to enhance the sturdiness. The images clearly showcase AT&T logo on the back which is stronger than the normal glass. The front part is also having the protection and there is nothing surprising, at least in the pictures we see now. SM-G890A is going to be the model number of this device and it will pack a 3,500mAh battery. Because of being wrapped in a tough cover, fingerprint sensor will not be present. Loudspeaker grill at the bottom is moved to the rear side, as we can see in pictures. Heart rate monitor and camera units are at the back, just like the Galaxy S6. It is also rumoured that Samsung may not introduce this device with the same high set of specifications which are part of current flagship and its Edge version. In the last month, we also updated you with an Optimal Thermal Protection Case which is being developed solely for those adventure trips. At that moment, the case was developed only for Samsung Galaxy S5 and iPhone 6, but I’m sure they are going to introduce Galaxy S6 to the lineup. Once they do, you should book one unit, as it will help you to keep 2015 flagship (also the number one Android smartphone at this moment) in a firm protection. So, which way sounds good to you? A rugged version i.e. Galaxy S6 Active or the normal S6 with a strong case?